The next upcoming Yom Kippur starts on sundown of October 8 ending at sundown on Wednesday October 9th, 2019. Yom Kippur is on the tenth day of the month of Tishri in the Jewish calendar. Known as the Day of Atonement, the Jewish holiday is spent in prayer and fasting among many people of the Jewish faith. The seven day festival of Sukkot commemorating the wandering in the desert for 40 years, begins on the fifth day after Yom Kippur. Rosh Hashana and Yom Kippur are the two important days of atonement that most practicing Jews will go to a synagogue each year. Considered the holiest day of the year for the Jewish people, activities on Yom Kippur involve prayer and fasting. It centers around atonement and repentance. Fasting begins on the evening before and lasts 25 hours. Most of the time is spent in the synagogue. It is believed that a New Year is granted to those who repent from their sins. Breaking of the fast includes a Havdalah ceremony and taking part of a festive meal afterwards. Yom Kippur originated with the ritual purification from any impurities that might have occurred the past year in the Temple of Jerusalem. 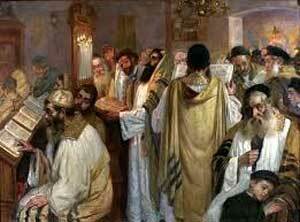 The high priest, the Kohen Gadol, enters the Holy of Holies (the center of the temple) on Yom Kippur. Rituals are carried out to make sure the high priest did not bring in impurities into the Holy of Holies. It was important that he was spiritually and physically pure.